Eden Housing Association is a small independent provider of affordable homes with a rural focus. We designed a bespoke WordPress website and developed it using Responsive Web Design so the site resizes for mobile and tablet. The improved design focuses on usability with a simplified navigation and a more user-friendly layout. 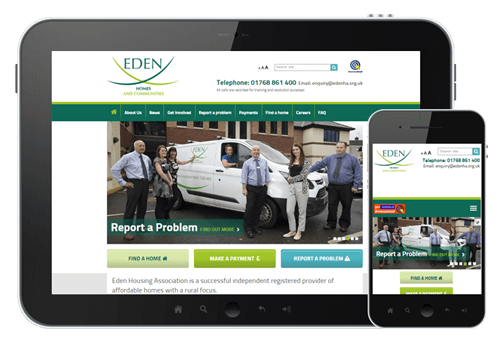 The new layout provides a clearer route to ‘Find a home’, ‘Make a payment’ and ‘Report a problem’ and offers users an easier way of contacting and connecting with Eden Housing Association.